When I press a tab, the new site will be load into the browser. Great! BUT the pressed button is not be marked. Always the Tab 1 is blue. What's wrong?? Q: I have one more question. I built the menu using Deluxe Tuner. I cannot find where to change the mouse over color from blue to something more appropriate in my drop down menu templates. Can you tell me where to do this? 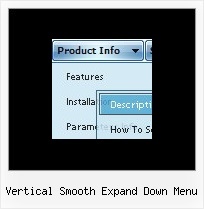 Expanding menus. single nested level · multiple nested levels ... change smoothly to youname.com/forum if I would choose it to?